Originally from Denver, Colorado, James joined the United States Navy shortly after graduating high school and was deployed twice to the Middle Eastern region in support of both Operation Enduring Freedom as well as the Global War on Terrorism. Eight years in the Navy providing Search and Rescue instruction and life-saving procedures enforced the desire James has for helping others. While stationed in San Diego, James finished his Bachelors of Science degree in Business Administration as well as met and married his wife Jessica. Shortly after being honorably discharged from the Navy in late 2005, James decided to continue his focus on helping others by beginning his career with Northwestern Mutual. 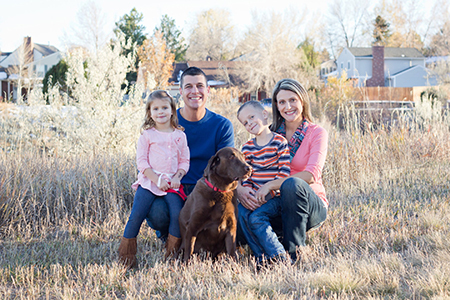 James and Jessica live in Littleton and enjoy time with their two children with all the outdoor activities that Colorado has to offer. James is an active member of his community mentoring at risk youth through the Save Our Youth organization, and personally erected and maintains a 2500 square foot garden in Littleton that provides fresh produce to local families in need.